Two computers developed the same problem, about the same time. I have cleared game cache, and uninstalled. I had very simmilar problem, fixed after reboot. Afterwards i started having trouble with steam conection. Problem fixed without intervention. Error is related to memory problems, check your latency and frequency settings for ram. P3jota wrote: check your latency and frequency settings for ram. Its an Imac so all them settings cannot be changed, thats if i even knew what that was lol. i would put money on that being your problem, unless you're 100% sure that drivers for everything are correct and up to date. 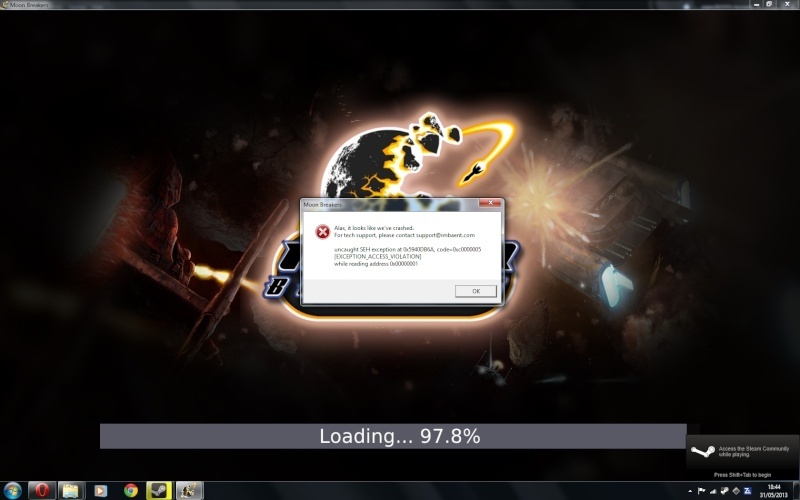 but seriously, the game is unstable and it has and does attempt to access memory areas it isn't allowed to (by mistake). if it was temporary, it could have been something as simple as packet loss / corruption when the game test connects upon loading. 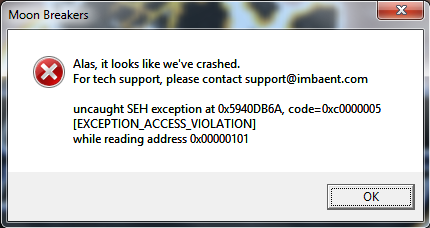 at least this is how other crashes occur with this message; game tries to use / refer to an object / data structure that has been deleted (deallocated in memory; program keeps the address) and therefore may have been allocated to another program, which would require special execution rights to do. if it happens consistently, different story. Its only happened this once. I run it in windows all the time though as a lot of the stuff i do runs better in windows. The problem is..... Apple makes it so you HAVE to use there drivers for the windows partition, some of which are from 2006, ive even seen some state they are from 2001. I swear when my laptop gets here in gonna smash this PoS. #EDIT: The drivers ARE the correct ones as apple makes it mandatory to use there drivers for this reason. There just old. Just as a note; Moonbreakers was never developed for Mac (or Linux) systems, though they had mentioned working on porting it. It was originally developed for play through the Chrome browser, then ported to a Windows appllication.